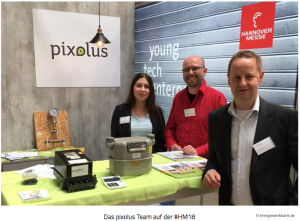 After 2016, pixolus was exhibiting for the second time at the HANNOVER MESSE 2018. The key topic of the 2018 edition was “Integrated Industry – Connect & Collaborate“ – which shall reflect the interaction of automation and energy technology, intralogistics and IT as a digitization driver of the industry. The most important robotics, automation technology, IT and software companies provided visitors an understanding of the so-called Industry 4.0 and the Internet of Things. Where perfected processes are indicated due to automation, there still remains a need for individual digitization. Not every production can be completely changed from one day to the next. At HANNOVER MESSE it became obvious that there is still a need for tailored digitization in many areas and levels – like startups may provide. Thus, existing processes can be optimized efficiently, instead of replacing already established procedures in a costly and time consuming way. Participating at HANNOVER MESSE was successful for pixolus: In some cases, visitors came to the pixolus stand after a keyword search in the exhibitor directory. In some other cases, there were also interesting contacts by chance – e.g. because visitors became attentive of pixolus through placed exhibits at the stand such as a manometer or an old gas meter. It is quite likely that some of those fair contacts will lead into digitization projects, where pixolus will be supporting user at their data processes by means of mobile image recognition and/or app solutions.